1. 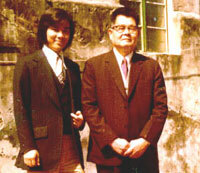 Sifu Sam Ng and Sifu Wong Shun Leung in the Hong Kong VTAA - Dec.1996 6. 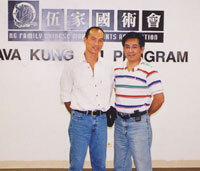 Sifu Sam Ng, Sifu To Sam and Sifu To Siu Chun in Sifu To's Hong Kong clinic. 2. Left to Right - Sifu Carter Wong, Sifu Sam Ng, Sifu Tung Kin Kwong, and Sifu Lee Yun Tim. 7. 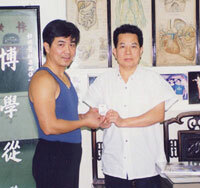 Sifu Sam Ng with his Sihing, To Sam, in his Hong Kong clinic. 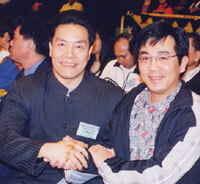 3.Sifu Carter Wong and Sifu Sam Ng in Hong Kong - 2001 8. 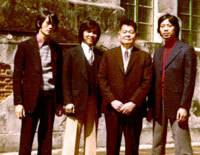 Sifu Sam Ng with his kung fu brothers and their teacher, Grandmaster To Hon Cheung. 5. 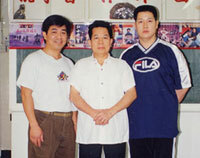 Left to Right - Sifu (un-named), Sifu Hung Kam Pui, Sifu Sam Ng, and Sifu Tung Kin Kwong. 10. 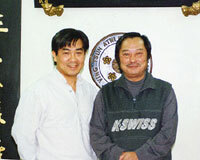 Sifu Sam Ng (right) with his good friend, Sifu Lee Siu-Hung at the Ng Family Chinese Martial Arts Academy.